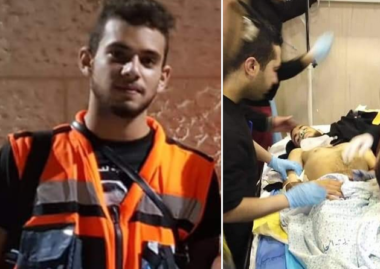 A young Palestinian paramedic, Sajid Abdel Hakim Helmi Mizhir, 17, was shot and killed by Israeli forces who opened fire at his despite wearing his clearly marked medic vest. He died of his wounds in the hospital soon after. The troops invaded Deheishe camp on Wednesday at dawn, and injured several Palestinians. Sajid was there to treat the wounded, when he was shot in the abdomen. During the invasion, the soldiers stormed and ransacked several homes, and abducted Mohammad Riziq Hammash, 21, Mahmoud Walid Lahham, and Ma’ali Issa Ma’ali, 27. The Palestinian Health Ministry issued a statement denouncing Sajed’s death, and stated that the constant targeting of medics and journalists is serious violation of International Law and all related international resolutions, especially the laws that protect civilians in the time of war. Palestinian Health Minister, Dr. Jawad Awwad, said the soldiers shot and killed Sajed with live fire, despite his clearly marked medic vest. He added that the Israeli crimes and violations against Palestinian medics have led to the death of four medics since 2018, in addition to dozens of injuries and serious damage to ambulances and clinics. It is worth mentioning that his cousin, Arkan Tha’er Mizhir, 15, was killed by Israeli soldiers on July 22, 2018, after the army invaded the refugee camp. Dozens of Israeli soldiers invaded, on Wednesday at dawn, the Deheishe refugee camp, south of Bethlehem in the occupied West Bank, shot five Palestinians, including a medic, and abducted three others. Media sources said the soldiers fired many live rounds, rubber-coated steel bullets, gas bombs, and concussion grenades at dozens of youngsters, who protested the invasion and hurled stones at the armored vehicles. They added that four Palestinians were shot with live fire before they were rushed to medical centers in Bethlehem, while many others suffered the effects of teargas inhalation. The soldiers also shot a medic, identified as Sajed Mizher, while providing treatment to wounding Palestinians. One of the Palestinians was shot with a live round in the abdomen and was rushed to surgery at the Arab Society Hospital for Rehabilitation, a second Palestinian was shot in the shoulder, a third in the thigh and the fourth in the arm. The soldiers also invaded and ransacked many homes in the refugee camp and occupied several rooftops to use them as firing posts and monitoring towers. During the home invasions and searches, the soldiers abducted Mohammad Rezeq Hammash, 21, Mahmoud Walid Lahham, and Ma’ali Issa Ma’ali, 27.